When the Arizona Fall League rosters were announced, the Peoria Javelinas soon became the talk of the coming season. With prospects from Atlanta, Toronto, San Diego, Boston, and Toronto, the Javelinas boast some of the hottest and well known prospects in the game. So far so good. The Javelinas are 13-10 and lead the Western Division. Whatever the nickname you want to give the quartet of Ronald Acuna, Austin Riley, Alex Jackson, and Max Fried, the superlatives one could derive would not be enough. Riley, Jackson, and Acuna came into today’s game tied for the AFL lead with 5 HR while Fried has posted a 1.96 ERA and 29K in 23 IP. While the baseball world is awaiting Acuna’s arrival in Atlanta, it is Jackson and Riley, teammates in 2017 at Florida and Mississippi that have used the AFL to boost their stock in the eyes of scouts and fans alike. Speaking of boosting stock, Fried, who struggled in 86 IP at AA, is the front runner for the AFL Pitcher of the Year and looks to be a serious contender for a spot in Atlanta’s rotation in 2018. Mesa entered the game 14-9 and leading the East. With prospects from Detroit, Houston, Oakland, Washington and the Chicago Cubs, the Solar Sox boast a lineup with 2 top 10 prospects in Kyle Tucker of the Astros and Victor Robles of the Nationals. Unlike Acuna, Robles and Tucker have not set the AFL on fire. Robles entered the game hitting .241 while Tucker has hit. 194. It has been Sheldon Neuse of Oakland and David Bote of Chicago that have paced the Solar Sox offense bashing 4 HR each. A Potential Look at Next Week’s Championship? Today’s matchup pitted Astros 14th prospect according to MLB.com, Framber Valdez against Padres farm hand Walker Lockett. Valdez was tough through 4 scoreless IP scattering 4 hits to 1 walk and 2 K. Valdez was able to use his offspeed pitches to keep Peoria off balance, inducing a 50% GB rate. On the other side, Lockett struggled, allowing runners on base every inning. Charcer Burks started the game with a first pitch double down the LF line and while he was stranded, the Solar Sox had no problems forcing Lockett to pitch out of jams all day. It wasn’t until the top of the 3rd, when David Bote singled in 2 runs to start the scoring. Lockett was able to wriggle out of that jam and get through 5 IP down 2-0. Peoria got on the board with 1 run in the bottom of the 6th against Cubs phenom Albert Alzolay. Braves OF Jared James, who appeared to be a late addition to the lineup in place of Ronald Acuna, started the rally with a line drive to LF. Tigers Cam Gibson laid out but was unable to secure the catch. When the ball rolled past him, James was able to leg out a stand up triple and was later driven in by Mariners’ OF Eric Filia. Peoria struck again in the 8th against Solar Sox and Nationals pitcher Austen Williams. 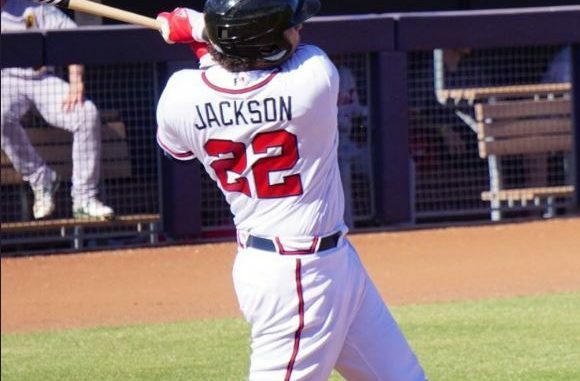 After striking out Austin Riley looking, Alex Jackson reached on a strikeout and wild pitch. Jared James singled again and then Filia struck again, roping a long double to RCF scoring 2. Going to the 9th, Peoria was in good shape giving the ball to Red Sox RP Ty Buttrey, who had posted a 1.42 ERA in 6.1 IP, but singles by Oakland’s Sean Murphy and Detroit’s Kody Eaves set the stage for Cubs 1B Jason Vosler. Vosler was up to the task and roped a single to RF to tie the game. Going into the the 10th, in an effort to avoid long extra inning games, each team starts the inning with a runner at second base. Andrew Case of the Blue Jays entered the 10th with Cam Gibson starting on second. Nationals 3B Kelvin Gutierrez lined a 2 out single through the right side to give Mesa a 4-3 lead. Ronald Acuna was listed on the line ups given to media 3 hours before game time but was later replaced by Braves OF Jared James. No word on if this was an error or if Acuna was scratched due to injury. It is likely this was a day off given Acuna has appeared in 19 of the Javelinas’ 24 games. Blue Jays SS Lourdes Gurriel went 2-4 and was robbed of a 3rd hit by Kelvin Gutierrez. Astros super prospect Kyle Tucker’s first two at bats occurred with RISP but the young lefty swung at the first two pitches he saw, resulting in a pop up and a weak grounder to first, allowing Lockett to avoid further damage. In his next two at bats, Tucker was much more patient, resulting in a walk and a single.